Welcome from the JC Raulston Arboretum. I'm writing this message in early May, unfortunately a few days after Chris Glenn's deadline for submission. But what's he going to do, fire me?! In the tradition of JCRA newsletters, this one is being prepared and delivered much later than we had hoped. In part, this was a function of the time and effort devoted to preparing our first JCRA Annual Report, which required more time than we had anticipated. We hope you enjoyed our Annual Report. Lots of activities, progress, and changes here at the JCRA since our last newsletter hit your mailbox. I've now been at the helm over one year, and I'm pleased with the progress we have made programmatically and in the garden. Our 30th anniversary symposium held last September was a great success, and it was wonderful to be a part of all of the excitement and camaraderie. Thanks to all of our wonderful speakers, and to all of those that attended, for making this such a special and memorable event. We're already making plans for the fall 2008 symposium, and have a great keynote speaker lined up. For those of you that plan your life waaaaay far ahead, please put September 26-28 on your 2008 calendar. Of course, more details will be forthcoming. During the weekend of the 30th anniversary symposium, six gracious Raleigh families opened their beautiful gardens to visitors as part of the Garden Conservancy Open Days Program. A portion of the proceeds from the Open Days was donated to the JCRA. A heartfelt thank you to Helen Yoest and Anne Porter for their efforts in coordinating and promoting this event, and to Sylvia Redwine, Linda and Tommy Bunn, Helen Yoest and David Philbrook, Dave and Cyndy Allison, Mary and Bill Joslin, and Lacy and Carol Reeves for sharing their beautiful gardens. On the garden front here, the bed near the entrance to the Ruby C. McSwain Education Center, featuring a dynamic mix of woody and herbaceous plants, continues to develop. If you haven't been by the JCRA since September 2006, please go to the west side of the McSwain Center and enjoy our new Scree Garden. This planting features a wide diversity of xeric plants from the southwestern United States, Mexico, South Africa, and other similar habitats. Also in the West Arboretum, we are in the process of renovating the area adjacent to the Southwestern Garden, so keep your eyes open for new plantings in this area. Take a walk up to the roof of the McSwain Center, and you'll note we've completely renovated the plantings. Our goal was to transition the past green roof to a more inspirational and dynamic rooftop garden. Tim Alderton, research technician, compiled the list of plants for the new planting, so look forward to the dramatic changes made "up on the roof" (with apologies to Gerry Coffin, Carole King, and the Drifters). Heading east, you will note the old icon of the Arboretum, the "old brick house" has finally been brought down and hauled off. A sad and nostalgic event in some regards, but something that needed to be done to move forward. It will take some time to renovate and make this site suitable for planting, but the removal of the old house and tractor shed has dramatically improved the nature and spirit of this space. Closer to the Visitor Center, guests can now better enjoy the splendor and majesty of our magnificent crepe myrtles by walking on the new paths and sitting in the area adjacent to these award-winning trees. Throughout the Arboretum, we continue to assess the collections, and cull and install new plants. On the personnel front, one employee has left the JCRA to pursue other opportunities. Horticultural assistant James Lail departed to take a position in the nursery industry. James was with us since his first internship experience as a student at NC State University, and we'll miss him and all of the great contributions he made to the garden. Best wishes, James. After over two years of being vacant, I am pleased to announce that the JCRA assistant director position has been filled. By the time you receive this newsletter, Mark Weathington, currently the director of horticulture at the Norfolk Botanical Garden, will be on board. We are very excited about Mark's arrival, and the contributions he will make to the JCRA. Please read more about Mark's background and experiences on page 4. A sincere thank you is extended to the administration of the College of Agriculture and Life Sciences at NC State University for providing the funding for this critical position, and for their overall support. We are pleased to welcome two new members to the JCRA Board of Advisors, Mike Worthington from Ballards Crossroads, North Carolina, and Bob Rossier of Charlotte, North Carolina. The JCRA thanks them for their personal commitment and dedication as they serve in this important role. A sincere thank you also to past Board members Linda Lawson and Rick Crowder whose terms expired at the end of 2006. Thank you for sharing your time, talents, and wisdom, and for your dedication to the JCRA. I also want to take this opportunity to recognize and thank Pam Baggett for her many years of providing and installing the beautiful tropicals and perennials in our Entry Garden. Pam decided to relinquish her curatorial position after many years of designing traffic-stopping, crash-causing, mouth-dropping (I know, enough!) plant combinations at our Beryl Road parking lot entrance. Pam, all the best in your new pursuits. The JCRA Grass-roots Master Plan committee has worked very hard during the past year and has completed the physical master plan for the JCRA. The final plan is displayed on the walls in the McSwain Center, and has generated lots of positive feedback. I am so pleased that the JCRA now has a cohesive and exciting plan for future development of the gardens. Our goal is to create a network of paths and special garden spaces in the Arboretum to create a more effective presentation of our diverse collections, and one that will enhance accessibility, educational interpretation of our collections, and the overall visitor experience. A thank you to committee co-chairs Harriett Bellerjeau and Suzanne Edney, and committee members Richard Boggs, Jeff Evans, Robert Mackintosh, Matt Roberts, and Beth Jimenez, for their incredible efforts and dedication. It is always a pleasure to host so many special groups who visit the JCRA. We were honored to welcome the Kew Garden Guild group in October 2006. On a day that can only be described as magical, their visit occurred on a beautiful, warm autumn day when the gardens were graced with hundreds of monarch butterflies. Of course, it's an insect that those of us in the States take for granted, but one that many of the English visitors had never seen before, particularly in such abundance. As our guests walked the gardens and enjoyed the beauty of the butterflies and plants, I was again reminded of the important role of the Arboretum as a special space where guests can reconnect with nature. Later on that same autumn day as I was walking the Arboretum, I came upon a guest in reflective pose under the beautiful Japanese crepe myrtle in the Japanese Garden. As we exchanged glances, he said to me, "I come here to soak up the spirit of the place." In my mind, that says it all. Take care, and please come visit your JC Raulston Arboretum. Texas plantsman Scott Ogden has written a new edition of his Garden Bulbs for the South. This book on Southern bulbs was recently released by Timber Press. I haven't yet had the opportunity to read this second edition, but the first edition has always been the first source I turn to for information on the culture of Southern bulbs, and the fascinating horticultural history of this great group of garden plants. I'm certain the second edition will be a great resource. This past summer, I had the opportunity to meet John Grimshaw when he spent a few days at the JCRA studying our collections for a new book he is writing. John is the gardens manager at Colesbourne Park in England, and is also a committed "galanthophile" (galanthus nut!). John coauthored a 2002 book with Matt Bishop and Aaron Davis entitled Snowdrops: A Monograph of Cultivated Galanthus. Out of print for a few years, it has now been reprinted by Griffin Press. Closer to home, JCRA Board of Advisor member Ann Armstrong of Charlotte, North Carolina, co-edited a new book, with Lindie Wilson, entitled Beautiful at All Seasons: Southern Gardening and Beyond with Elizabeth Lawrence. A great addition to the other texts on the writings of Elizabeth Lawrence, this new contribution presents 132 columns Elizabeth Lawrence wrote for the Charlotte Observer over 14 years. It's hard to believe that I've been teaching my undergraduate herbaceous perennials class for ten years. What started out as an experimental class taught to about 20 students in 1997 has ballooned to 90 students this spring semester. I'm thinking these students must be desperate for entertainment! Finding an appropriate textbook for this class has always been difficult. This semester, I chose the new text entitled Encyclopedia of Perennials: The Definitive Illustrated Guide, edited by Graham Rice and Kurt Bluemel, and published by the American Horticultural Society. I am very impressed with the amount and quality of information in this book, and the vast number of excellent color photographs provided. Almost 500 pages long, this text is an excellent and up-to-date resource for anybody passionate about herbaceous perennials. In addition to the abundant information provided on 2,000 perennial species, and thousands of cultivars, the text is replete with interesting features on diseases, breeding history, propagation, design considerations for numerous species, etc. The writings of Wendell Berry have always been thought-provoking and a source of inspiration to me. His earlier books, particularly The Gift of the Good Land and The Unsettling of America, speak with clarity and eloquence on the issues of community, respect for the land, and agricultural and environmental stewardship. I just recently obtained his most recent book, The Way of Ignorance, in which Wendell, now 73 years old, presents a series of short essays expressing his concerns about the state of our environment, farms, communities, economy, and society. It's a thoughtful and sobering book in many ways, but one which I believe you will enjoy reading. As an aside, he often refers to the writings of and his friendship with Wes Jackson, Ph.D., founder of the Land Institute in Kansas. Wes is an alumnus of NC State University, having received his Ph.D. in genetics in the 1960s. He is a brilliant and remarkable man, and you may wish to explore some of his books, which I am certain will be of interest to many of you. Wes' positions on current agricultural systems and the role of land grant universities in promoting "industrial agriculture" are often controversial and at odds with the thinking of many scientists who work in land grants, but I find his thoughts and ideas very interesting. He's a past recipient of a MacArthur Foundation Fellowship. Scientists have long proposed that our sense of smell is the sense most associated with memory. In a new plant-related twist on the relationship of scent and memory, a recent study in Science reported that exposure to the scent of a rose during sleep improved performance on a subsequent short-term memory test by almost 15%. I can see it now – rooms of undergraduate students brimming with stems of fragrant roses during finals week! To read more about this interesting research, go to the New York Times' Web site at http://www.nytimes.com/ and search for the article by its title: "Study Uncovers Memory Aid: A Scent During Sleep." China has about twice the number of plant species as the continental United States, and one-eighth of the world's total. Access to English language descriptions of the vascular plant species of China is problematic. The Flora of China is a new ongoing effort that will describe and document the approximately 31,000 plant species in the botanically rich country of China. More than 600 scientists from throughout the world are cooperating on this project. To access this remarkable database, go to http://flora.huh.harvard.edu/china/. It's interesting to browse this site. In doing so, one gets an appreciation for the incredible diversity of plants in China, and for the number of Chinese genera that also are represented in North America. The Mixed Border has a variety of plants. The ones that really stand out in the winter months yet look great at all times of the year are the conifers, for they offer structure, shape, color, and texture. Starting at the west end of the Mixed Border, I will describe conifers that have done well and merit attention. All of these are good examples of conifers that will grow well in the Southeast. There is a "tapestry hedge" of four different conifers planted in 1989. Chamaecyparis obtusa 'Chabo Yadori' is over 15' tall. As a young plant, it has soft, blue-green foliage maturing to green scale-type foliage. Its cultivar name means bantam's nest, referring to its unkempt look. The mature plant is dense, irregularly tufted, and displays juvenile and adult foliage at the same time. It is hardy to USDA Zone 5 and available at local nurseries. Next in the tapestry hedge is Chamaecyparis obtusa 'Crippsii', the golden fernspray Hinoki falsecypress, at over 16' tall. Fernspray is very descriptive of its feathery textured foliage. A medium growing conifer with wide-spreading, golden yellow branches, it is especially striking in winter. Hardy in Zones 4-8, it prefers sun and a well-drained soil. Also in the hedge is Thuja occidentalis 'Sudworth Gold', the golden American arborvitae. Our specimen is over 11' tall with a broad pyramidal form. Its branches end in flat, spreading, horizontal sprays, showing a dark gold coloration. The species is native from Nova Scotia to North Carolina, and is hardy in Zones 2-8. Completing the hedge is Chamaecyparis pisifera 'Squarrosa Lutea' at a height of 15'. This conifer has a more open structure with a conical shape. The foliage is feathery and light yellow and is soft to the touch, always a positive attribute for the garden. On your right as you walk towards the arbor stands Pinus wallichiana 'Zebrina' at approximately 28' tall. Striking in all seasons, the needles are variegated with zebra-like, cream yellow bands, resulting in beautiful light beige pine straw in the fall. The slender needles, 5"-8" long, create a feathery, drooping effect on the tree. According to Michael Dirr, Ph.D., this species withstands atmospheric pollutants better than most conifers, a consideration for our landscapes. 'Zebrina' presents a graceful effect in the landscape and I have seen it at local nurseries. Close by on your left is Chamaecyparis thyoides 'Rubicon'. Planted from a gallon pot in 1997, it is now nearly 9' tall. It has a dense, compact columnar shape with soft, blue-green foliage in summer, turning purple in winter. The species is native from Maine to Florida and west to Mississippi. It has multiple trunks that can splay open, especially from the weight of snow or ice. In 2004, we wrapped this specimen with grapevines to help hold its shape. It has worked really well, with the tree growing around the grapevine. Given an open space and full sun, the tree has retained a pleasing shape and full foliage. It also is available locally. Past the arbor, on your left, is Chamaecyparis obtusa 'Blue Feathers', a Hinoki falsecypress native to the mountains of central and southern Japan. Planted in 2006, it is just 29" tall. This conifer has a compact form and feathery foliage with a blue-gray color. When young, it has a globose habit, but matures into a loose column. In ten years, it will be 5'-6' tall. It is very appealing for its blue color, soft texture, and manageable size. Ahead to your right will be Thuja occidentalis 'Filiformis', the threadleaf American arborvitae. It's hardy in Zones 3-7 and prefers full sun and well-drained soil. This American arborvitae has been in the Mixed Border more than 16 years and is over 7' tall. It has green, long, cordlike, drooping branchlets that give it a unique and attractive appearance. With a compact pyramidal form and a slight weeping habit, it would be an interesting specimen for the home landscape. Just past the American arborvitae, you will see 'Limelight' – you can't miss this Cupressus arizonica. Planted from a gallon pot in 2004, it is now 10' tall and has bright lime-yellow foliage. The species is native from Texas to Utah and California and south to northern Mexico. Its evergreen scales are overlapping, giving a braided effect up close, and a soft texture. It is hardy in Zones 7-9 and prefers hot, dry conditions and full sun. Cupressus arizonica 'Limelight' has a narrow conical shape and retains its colorful foliage throughout the year. It makes a striking exclamation point in the border! On the right, you will see two Taxus specimens, Taxus wallichiana var. mairui (right) and Taxus wallichiana var. chinensis, as you continue toward the bog bridge. They are 13' tall and 10' tall, respectively. The Himalayan yew can be spreading or upright pyramidal in shape. It is fast growing, and likes shade and well-drained soils. Its dark green leaves are linear with spiny tips. The tree responds well to pruning, so watch the Mixed Border for changes. The Pacific yew, Taxus brevifolia, is the original source of paclitaxel (Taxol), a chemotherapy drug used in the treatment of various forms of cancer. Toward the eastern end of the Mixed Border there is Platycladus orientalis, an 18' tall, medium green conifer. It was planted in 1999 as a two-gallon plant. It can grow to 40' with a broad conical shape. Dense branches have shoots that spread into flat, vertical planes, a distinctive characteristic. Hardy to Zone 6, it keeps its dense foliage to the ground, making it useful for screens or windbreaks. The Oriental arborvitae does well on poor soils, even those with a high pH, and once established, it is drought tolerant. There are many cultivars of various sizes and foliage color to use in your landscape. Our final stop on the conifer stroll is a Chamaecyparis thyoides, Atlantic white cedar, that's 15' tall. Native to the East Coast states and hardy in Zones 4-8, it is a tall, slender, columnar tree reaching 40' in height. It requires sun, but tolerates a range of soils, naturally growing in swamps and bogs. Its scale-like foliage is bluish green. There are cultivars that have a more suitable height for home landscapes: 'Rubicon', described earlier; 'Andelyensis' to 10' in height; and 'Little Jamie', which grows slowly to 4' in height. I hope these descriptions have sparked an interest in using conifers in your garden. There are many grown successfully in our humid, drought-prone Southeast climate, and they come in all shapes, sizes, and color. They will add color, interesting texture, and special winter interest to your garden. Most folks who have ever read a gardening book or plant catalog are familiar with plant hardiness zone maps. The first U.S. map with eight hardiness zones was compiled at the Arnold Arboretum in 1927 by Alfred Rehder, Ph.D., based on a survey of plants and their survivability in different regions of the country. The map was first published in Alfred Rehder's Manual of Cultivated Trees and Shrubs. In 1938, Donald Wyman, Ph.D., of the Arnold Arboretum published a new map in his book, Hedges, Screens, and Windbreaks: Their Uses, Selection, and Care, that used 40 years of data (1895-1935) from the U.S. Weather Bureau. The Arnold Arboretum map was updated in 1951, 1967, and 1971. In 1960, the U.S. Department of Agriculture got into the act, publishing its first map, based on the data from 450 weather stations around the country. Unfortunately, they used different criteria from the Arnold Arboretum for establishing their zones, resulting in two conflicting maps. The Arnold Arboretum map remained the standard over the 1960 USDA map until 1990, when the U.S. Department of Agriculture, in cooperation with the U.S. National Arboretum, updated the USDA Plant Hardiness Zone Map, using data from between 4,800 to 14,500 weather stations. Various publications by Marc Cathey, Ph.D., who oversaw the map project, have given a wide variety of radically varying weather station numbers. I expect the low end would be more accurate. Although he also claims to have used a 15-year dataset, the 1990 map actually used a 13-year dataset from 1974-1986 (United States) and 1971-1984 (Mexico). This revision shifted most areas into zones that were one half to one zone cooler than the previous Arnold Arboretum map. With hardiness zone maps, gardeners could now trace zone lines around the country to find out which plants they could possibly grow in their own region. Let's see here...Raleigh, North Carolina, is in the same zone as Reno, Nevada; Dallas, Texas; and most of Vancouver Island in Canada...could this be right? In fact, the answer is a resounding "No." You are beginning to see a few of the problems with the USDA Plant Hardiness Zone Map. Each of the current USDA 20 climatic zones (Zone 1, 2a/2b-10a/10b, and Zone 11) is based on the average minimum winter temperatures. In Zone 7b, which includes Raleigh, our average winter minimum temperatures should be from 5°F-10°F. Keep in mind that there is often a major difference between what will grow in the "a" and "b" regions of each zone. What the winter hardiness map doesn't tell us is how many times the temperatures dropped that low, and how long these low temperatures lasted. There are a number of plants that can survive 5°F for a couple of hours, but which could not survive these temperatures for a longer period, or more than once during a winter. Cold temperatures for one night is not the same as cold temperatures for a period of weeks, even though the same low temperature is reached in both cases. In many cases, a low temperature of 0°F may cause cellular damage that will start to heal if the temperature rises rapidly. If the temperatures remain low for several days, cell damage may continue and result in the death of the plant. It is truly difficult trying to assign a hardiness zone to all plants, especially when using the minimal 10 USDA climatic zones. This is why we find it critical to differentiate between the "a" and "b" zones whenever possible...we would prefer a "c" and "d" also. A drawback to growing new and different plants is that there is no information on their hardiness. Another factor not taken into account by maps is winter acclimation. A plant growing in our gardens in midsummer can be easily killed by temperatures in the 20°F range. The same plant, if properly acclimated, can withstand temperatures of -20°F. We see the exact same thing in some late spring frosts. After a certain number of hours at a specified temperature, each type of plant will switch from a dormant winter mode to a growing spring mode. It is at this point that winter hardiness is lost. If a late frost occurs while the plant is still in its dormant mode, there is little, if any, damage. If the late frost occurs after the plant has switched to active growing mode, even a mature tree may be killed. If we have an abnormally warm fall, many plants that rely on cool temperatures to trigger dormancy can be killed when the temperatures drop suddenly. Several years ago, we went from 70°F to 4°F in the same day, suffering losses on many "hardy" woody plants that simply had not prepared well for winter. In Raleigh, we have found many "tropical" plants to be hardy that are not hardy further south in Florida. Unlike climates further south, we have a cool period in fall that allows the plants to shut down and prepare for winter. Another phenomenon, seen in England and in the cool areas of the West Coast of the United States, is the difference in winter hardiness due to a lack of summer heat. In many plants native to warmer climates, summer heat causes increased sugar production, which allows the plants to survive more stress in the winter. In areas without summer heat, a particular plant may only be hardy to 20°F, while in an area with hot summers, the same plant may easily be hardy to 0°F. Another factor in hardiness is precipitation. I trade plants with friends in New Mexico, who are in the same hardiness zone as we are in North Carolina. In New Mexico, the plants receive less than 10" of rain per year, while we can receive more than five times that amount. We have discovered that there are a number of plants that can survive our cold temperatures, but cannot tolerate winter moisture. A good example is many of the barrel type cacti which are naturally found in very cold mountainous regions, but regions that receive no winter rainfall. The opposite effect is equally dramatic. Snow which blankets many areas in "snow belts" helps to insulate many "non hardy" plants. Gardeners whose gardens are covered in snow most of the winter are often able to grow plants, especially perennials, nearly two zones outside their normal range, due to the insulating effect of the snow. On woody plants, a snow layer will often protect the roots and lower branches of a plant while the top growth is still killed back to the snow line. Ice is an entirely different matter. Ice doesn't have the insulating effect of snow, since there are no buffering air spaces. A plant under an ice layer will actually "supercool" and become colder than the ambient outdoor temperature. Many growers use ice to protect crops during freezes, but this only works at a very narrow range of temperatures (not below 24°F), and only if water is constantly applied (and at the proper rate). As the water freezes, it releases heat. As soon as the water application ceases, the protection disappears also. How about provenance? Provenance, in lay terms, means where did the parents come from? Just like children, offspring bear some resemblance to the parents. Plants are similar, in that seed taken from a tree in Minnesota will be more cold hardy than seed taken from the same type of tree in Florida. Conversely, the plants from the Minnesota seed source might never break dormancy in Florida due to the lack of winter cold. Plants, however, that migrated from a cold region to a warm region during glaciation or other such event may not necessarily lose winter hardiness until many millennia later. This is why many plants from regions such as the Florida Panhandle (Zone 8b) are hardy to Zone 5. The issue of provenance is important in perennials, but not nearly so as it is in woody plants. Since perennials usually die to the ground in winter, there are no above ground parts to sustain winter damage. Many reference books may indicate that red maples are hardy from Zones 2-9. Granted, there may be red maples growing in both areas, but to interchange seed from each area would likely prove disastrous. This problem is particularly dramatic in woody plants that are grown from seed. It is also usually the most important at the extremes of the zone for each plant. In the case that we mentioned, the gardeners in Zones 2 and 3 and Zones 8 and 9 would need to be the most cautious of the provenance. Cultivars, or vegetatively propagated identical plants (clones), keep the same hardiness regardless of where they are produced commercially. In other words, Hemerocallis 'Stella de Oro' has the same hardiness whether it is produced in Florida or Chicago. The hardiness of a plant is based on the origin of the original genes, not where we, as humans, move the plants. Also related to hardiness is the issue of fertilizers. Research has indicated that a fall application of a high potassium fertilizer (assuming the plants or soils are deficient) aids in winter survivability of many plants. Conversely, an early fall application of nitrogen can make plants which are not induced into dormancy by day length continue to grow, causing them to be more susceptible to winter damage. We have all heard about not pruning some shrubs in late summer and fall. This is because some plants respond to pruning by producing new growth which is quite tender and is easily killed since it has not become acclimated to the cold temperatures. If you enjoy growing plants in regions which are too cold, try to create microclimates. Microclimates are areas of your garden that are particularly protected, such as near a brick wall, near heat vents from the house, near a body of water, between two structures, in courtyards, or other such areas. Good plant nuts can usually squeeze out an extra zone in either direction...that should build some egos! If you enjoy experimenting with marginal plants, I urge you to invest in battery-operated, digital minimum/maximum thermometers. These can be placed around your garden and will record and save minimum temperature readings. You can determine which areas stay warmer in the winter and use this information to site marginal plants. As mentioned, the siting of marginal plants is critical. Marginal evergreens should be located on the north side of a structure or in some shade in the wintertime. With the ground frozen, the evergreen foliage is desiccated since water given off to the sun and wind cannot be replenished. With deciduous marginal plants, a location in a sunny spot will allow the ground to warm, often making the difference in survivability. Not to be overlooked are rodents that are active in the winter. Many reports of plants that didn't survive the winter temperatures are actually plants that have become dinner to hungry rodents. Be aware particularly of voles, tiny rodents that tunnel around your plants (especially the expensive ones) and snack during the fall, winter, and spring. A dead plant with a quarter-sized tunnel nearby is a sure sign of voles. Check with your local Cooperative Extension Service on eradication methods available in your area. One of the most frustrating problems for gardeners in the south is summer hardiness. Reference books and most plant catalogs have completely neglected the effects of heat on plants. Many plants from the north are not able to withstand our hot summers. In 1997, the American Horticulture Society published a "heat map," and while a good idea, the map as published serves no practical purpose for gardeners. The Plant Heat-Zone Map confuses gardeners with two sets of numbers...i.e., USDA Zones 5-9 and AHS Zones 9-5. One set of numbers is for cold and one for warmth. There is no reason that one complete map could not serve both needs. A good example of a heat hardiness discrepancy is lady's mantle (Alchemilla vulgaris), a perennial featured in English gardening books. Due to our summer climate in Raleigh, North Carolina, it is virtually impossible to grow this plant in the south. Another example is the beautiful mountain ash (Sorbus sp.) with the bright red berries in the fall. Try as we might, mountain ash will not tolerate our summers. But wait, gardeners in Zone 7 on the West Coast can grow these plants successfully...what gives? The Plant Heat-Zone Map simply shows the number of days above 86°F or each region of the country. Heat hardiness is more an issue of night temperatures, humidity, and precipitation during the hot season, not simply the number of days above 86°F. As we mentioned, another wrench enters the picture when we talk about night temperatures as compared with day temperatures. In many cases, the culprit is not only the high day temperatures that cause plants problems, but also the high night temperatures. During the day, plants store up energy produced through photosynthesis. If the nights are cool, the energy goes into growth of the plant. If the nights are too warm, the energy is burned up by the plant. Many plants, due to their metabolism having derived in a cool night climate, are not hardy in other areas, simply because of the warm night temperatures. There is still another factor in heat hardiness that we have overlooked...one of dormancy. A hosta, for example, will not grow well in parts of Florida, (parts of Zone 9 and 10). The problem here is that temperatures do not drop low enough in the wintertime for the plant to go completely dormant. Many plants, both perennial and woody, must have a specific dormant period in order to start growth again in the spring. A hosta must be exposed to at least one month of temperatures below 40°F. If this temperature requirement is not met, the plant will begin to decline in the spring. In the case of some trees, they will not resprout in the spring until the dormancy requirement has been satisfied. After the 1997 Plant Heat-Zone Map fiasco, the American Horticulture Society made an even bigger horticultural faux pas when, in 2003, they published a draft revision of the 1990 USDA Plant Hardiness Zone Map. It's called a "draft" version because interested parties notified the USDA about the impending screw-up just prior to publication, and the project was halted immediately. The 2003 draft map, using data from 4,700 weather stations, was compiled using the premise that the climate had warmed so dramatically that only the last 15 years (1987-2001) of climatic data was needed. This recent data shifted Chicago, Illinois, into Zone 6, making for a true horticultural disaster when a real winter such as 2002-2003 occurred. The 2003 map also eliminated the "a" and "b" designations which would put two completely different climates, such as Wilmington, North Carolina, and Wilmington, Delaware, into the same zone. This change was being made to make the map more "readable." The 2003 map also added more tropical zones, 12-15. The 2003 map certainly tops the all-time horticultural "what were they thinking?" list. In 2006, the Arbor Day Foundation released a map similar to the 2003 AHS map, which made the same unfortunate errors in judgment by including only 10 zones and using a 15-year dataset. On August 18, 2004, a group of stakeholders met at USDA-ARS offices in Beltsville, Maryland, to discuss the 1990 USDA Plant Hardiness Zone Map revision. The August 18 meeting included representatives from USDA-ARS, the American Horticulture Society, the American Association of Botanic Gardens and Arboreta, university researchers, and representatives of the nursery industry. There have been several meetings since, as work on the new map progresses. The map revision project will consist of two phases. In Phase I, the map will be reconstructed using the most recent 30 years (up from 15 years) of average annual extreme minimum temperatures. The map will also retain the "a" and "b" designations for Zones 2-10, but not for Zone 11 and Zone 1. For the first time, the map will include a better breakdown of coastal and lake effects, urban heat islands, and elevation differences. The map will be made available online where it can be searched both by city and ZIP code. Phase II of the project will hopefully involve overlay maps for other factors such as duration of cold, summer heat factors, and perhaps even air flow patterns. What I hope you will realize is that growing plants can be very complex. The hardiness zone maps are a great guide, but are only a guide and only when the zones assigned to plants by nurseries are accurate. Don't be frustrated when a new plant dies, and certainly don't give up trying to grow that particular plant. After you kill it three times, use the compost you've created to help another plant. Magnolias are quite common in the landscape here in the Raleigh area. It is not uncommon to see Magnolia grandiflora, especially M. grandiflora 'Little Gem', as well as many of the flamboyant, pink, deciduous hybrid magnolia cultivars growing in the front yards of homes or in the median of the streets. I admire these magnolias, but there are other far less frequently used magnolias that deserve more attention as landscape plants. The ones that have caught my attention most are the now former genera of Manglietia and Michelia, both of which are now being classified as Magnolia. They were originally separated from the genus Magnolia for minor differences in the location and structure of the flowers. Both manglietias and michelias are native to largely tropical and subtropical areas in Southeast Asia, but hardy forms of many of the species have been found that grow well into Zone 7. Their foliage is evergreen to semi-evergreen, depending on species and climate. We have had flowers on some species for up to six months of the year, and their fragrances can be amazing. The approximately 55 species of Manglietia are now included in the Magnolia subgenus Magnolia section Manglietia. Mangelietias hold their flowers at the terminal tips of the growth and are generally solitary. Of these many species, we currently have three species and one hybrid of Magnolia virginiana × Magnolia insignis growing at the Arboretum. The mangleitia that has been the most apparent in the gardens over the years is Magnolia yuyuanensis (formerly Manglietia yunnanensis), commonly called Yunnan wood-lotus. It was planted outside the Lath House in 1988 and stood there until it was moved to the old parking lot area in December 2003 to make space in and around the Lath House. It did not take to the move well, and lost most of the dense, lush branches covered in dark green, leathery leaves that it once had. The recovery has started, and its flowers returned in late spring 2006. Though I have yet to see it flower, I have been impressed by Magnolia moto. This one is located just outside the Winter Garden. Both vegetative buds and flower buds are covered in dense, golden brown tomentum (pubescence) that stands out from the large, deep green leaves. From what I have read, the 4"-5" fragrant flowers hang from a 2"-4" pedicel and the tepals are milky white with red stamens. This sounds rather spectacular to me. If you still like the color pink, Magnolia insignis, the red wood-lotus, is one of the few evergreen magnolias that has colors other than white to creamy yellow. We currently do not have one in the gardens, but I have seen one in flower at Tony Avent's Juniper Level Botanical Gardens during the spring of 2006. The outer three tepals of the flowers vary from brown- to purple-red and the inner tepals vary from milky white to pink. The flowers are similar in shape and size to the eastern native Magnolia virginiana of which there is a hybrid planted in W15. Its flowers look very similar to those of M. insignis. We have nine species and one hybrid in the garden of the approximate 50 species that make up Magnolia subgenus Magnolia section Michelia subsection Michelia. Michelias generally hold their flowers on both the terminal and lateral buds on the branches. This gives a prolonged display of flowering as the buds open along the stem at the base of each leaf. They also have a very long flowering season. Magnolia maudiae, the smiling forest michelia, were stars in January this year. They began flowering just before the New Year. There are three specimens of M. maudiae in the Japanese Garden, all with very different qualities both in flower and foliage traits. The largest, in the southeast corner of the Japanese Garden, is about 20'-25' tall and very dense. The flowers were 5"-6" across, a creamy white, and covered the tree from top to bottom. The other two trees are much smaller and open as they are growing in the shade. Their flowers were 3"-5" across and far less profuse. They all have beautiful, leathery, blue-green leaves and the flowers are wonderfully fragrant. Three other michelia are in the area between the Klein-Pringle White Garden and the Winter Garden, two of which just don't know when to stop flowering. Magnolia platypetala (right, left) and Magonlia foveolata (right, right) both began flowering in September 2006 and continued on and off through February. They were planted in the mid 1990s, and both are now about 15'-20' tall. The Arboretum's Magnolia platypetala has golden tomentum covering both its floral and vegetative buds. The creamy white color of the opening buds and already open flowers stand out in contrast to the golden tomentum and the dark green leaves. The fragrance of our M. platypetala is slight. Our Magnolia foveolata is very similar in appearance to that of M. maudiae, but scaled down in size. It has similarly blue-green leaves and fragrant pale yellow to creamy white flowers. They are 3"-4" across, but the individual tepals are more tapered to the base, giving them a more delicate appearance. The third species that you see in this area is Magnolia ernestii. Another is located in the Japanese Garden. This one has not flowered since I have been here, but the unique leaves are reason enough to grow it. If you take the time to look at it, the dark green foliage has the appearance of leather. The flowers would be about 2"-3" across, yellow, and occur in mid to late spring. Nearby in the Winter Garden, there is one of the most common of the michelias, Magnolia figo, the banana shrub. This is a spring and sometimes fall flowering, shrubby species that has cream colored flowers, often flushed purple, depending on the cultivar. These flowers smell sweetly with an overtone of banana, as the common name suggests. Of the spring flowering species of michelia, my favorite is Magnolia dianica (formerly Michelia yunnanensis). Commonly called the shrubby michelia, M. dianica generally grows as a somewhat sprawling, open shrub to small tree, 10'-15' tall and wide. It has rather small, white flowers, only 2" across, but they are very fragrant and stand out against equally small, dark green leaves. There are two currently in the gardens. The typical species can be seen in the Japanese Garden growing in a rather shady spot under a Japanese maple and our largest Magnolia maudiae. Despite the shade, it continues to flower well. The second, in NBa (west of the Perennial Border), is M. dianica 'Michelle' (above). 'Michelle', a selection made by Tony Avent and named for his wife Michelle Avent, is larger than the species in all parts and has a denser habit. It has 3", fragrant flowers in April. James Lail and I were able to root only one cutting of M. dianica 'Michelle' in the 2005-2006 winter. When it was auctioned at the symposium in September 2006, it already had several buds despite being only 6" tall. It is just a great plant! There are a few other manglietias and michelias in the garden, but I will let you discover them on your own. We planted some new species this spring so look for these during your next visit. If you have the opportunity to try these evergreen Magnolia species, jump at the chance as they are not that widely available yet due to some difficulty in propagation. They are worth the extra searching out and can actually extend the magnolia flowering season and add attractive leaves, and buds in your landscape. Betula nigra, the common river birch, is a versatile landscape tree, adapted to a diversity of soil types and landscape situations. Thanks to the keen eyes of John and Daniel Allen of Shiloh Nursery in Harmony, North Carolina, a weeping form of this native tree is now widely available to consumers. John and Daniel have discovered a number of interesting and unusual plants in their nursery over the years, but none has commanded quite the same attention as 'Summer Cascade'. 'Summer Cascade' was discovered as a chance individual growing in a row of river birch seedlings. The original plant formed a small 4' ball as compared to its much taller siblings, and immediately was recognized for its landscape potential. At the JCRA, our four-year-old 'Summer Cascade' has formed a beautiful, small, 6' tall tree next to the Manooch Cascade, a perfect setting for this graceful plant. I particularly enjoy this plant because of its year-round landscape virtues. The graceful, pendulous branches show a distinctive character during both the growing and dormant seasons, and winter provides an opportunity to appreciate the attractive, exfoliating bark. 'Summer Cascade' is easily propagated by softwood and semi-hardwood cuttings, but because it is a patented cultivar (U.S. Plant Patent 15,105), a propagation and marketing license must be obtained. In a kind gesture of generosity, Shiloh Nursery shares a percentage of the royalties collected from sales of 'Summer Cascade' with NC State University to support ornamentals research. John and Daniel, thank you for your generosity. Continuing on the theme of plants discovered by North Carolina nurserymen, this new golden wax myrtle comes to us from Pat McCracken of McCracken's Nursery in Zebulon, North Carolina. Pat has a keen eye for detail and variation, and in a population of thousands of newly germinated seedlings, he observed an individual plant with a streak of gold in a single leaf. Recognizing the potential of this mutation, Pat repeatedly pinched the seedling as it grew, forcing lateral growth, and ultimately recovered a lateral shoot that was homogeneous for golden leaf color. 'Soleil' is not yet in commerce, but should be available in 2008. 'Soleil' shows bright golden leaf color, particularly on new growth, since the gold color slowly fades as foliage ages. Color is best in full sun. Pat has informed me that 'Soleil' has average vigor and height, and is a male clone with bright reddish-orange flowers. Wax myrtle is a widely used and rugged plant, and the availability of a gold-leaf form broadens the possible landscape uses of this great native plant. Wax myrtle performs well in a diverse range of soils, and works well as a foundation plant or in an informal landscape setting. A plant patent has been filed for 'Soleil'. 'Duet' is a newly released, variegated cultivar of the popular Asian beautyberry. I have always preferred the Asian species of beautyberry to our native species due to its smaller leaves and more graceful, semi-pendulous architecture. "Duet' was developed by Sandie Reed, Ph.D., ornamentals breeder with the U.S. National Arboretum in McMinnville, Tennessee. 'Duet' was discovered as a bud sport on Callicarpa dichotoma 'Alba', and demonstrates a white edge/green center variegation pattern, and like 'Alba', produces white fruit. 'Duet' performs well in full sun, but may best be sited in partial shade to reduce the risk of leaf burn. 'Duet' is not patented or trademarked, and no restrictions on propagation and marketing exist. In the past, visitors walking up the steps along the Duch Stair Cascade Garden appreciated the beauty of this Mexican beautyberry when it was in fruit. Our accession of C. acuminata forms a somewhat coarse and gangly medium sized shrub, with stiff, thick stems. However, when C. acuminata fruits in late summer to early fall, all of its vegetative shortcomings are forgotten. Fruit are large, deep wine-rose in color, and produced in great abundance. Often, both flowers and mature fruit can be found on the plant simultaneously, adding to the landscape interest. Hardiness of C. acuminata is probably limited to Zone 7. This specimen was recently relocated to bed W60. Plantsman and JCRA friend Ted Stephens of Nurseries Caroliniana of North Augusta, South Carolina, discovered this wonderful selection of our native yaupon holly some years ago, and was so pleased with its ornamental attributes that he recently named it 'Carolina Ruby'. 'Carolina Ruby' was discovered as a seedling selection of I. vomitoria 'Folsom's Weeping'. Ted grew out a large population of seedlings from 'Folsom's Weeping', and all seedlings were tall and gangly except for one very compact and dark green individual. 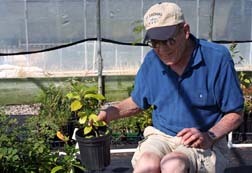 Ted says that this seedling was so compact that he initially thought a seedling of Ilex crenata had somehow gotten mixed in with the seedlings. The seedling produced its first fruit at seven years of age (a function of juvenile growth phase*). 'Carolina Ruby' produces an incredible abundance of glossy red fruit that literally covers the plant in fall and winter. Ted relates that the fruit actually encircle the branches and the plant will even produce flowers and fruits along old stems which have long since lost their leaves. Even 3" plugs derived from cuttings or from tissue culture flower and fruit readily. 'Carolina Ruby' is very dense and compact, only growing about 4"-6" a year. Ted's original, nine-year-old plant has attained a height and breadth of about 3'. 'Carolina Ruby' flowers at the same time as I. vomitoria 'Schillings', so this cultivar makes a great male pollinator. Ted states that propagation of 'Carolina Ruby' is challenging. It is being propagated via micropropagation in various labs, as standard stem cutting propagation has proven to be difficult. I. vomitoria works well in numerous landscape settings, from formal foundation plantings to informal mixed borders, and is a great choice for attracting birds to the landscape. A plant patent has been filed for 'Carolina Ruby'. *Please recognize that this long interval to produce fruit is indicative of the juvenile phase of growth that all woody plants demonstrate when propagated from seed. Length of the juvenile phase varies depending on the species and the growth rate of the plant. Upon the transition to adult phase growth, flowering and fruiting begin. Plants derived from vegetative propagules taken from adult phase growth retain adult phase characters including the ability to flower, and will flower and fruit readily in the landscape after establishment. 'Kaleidoscope' is a new addition to the long line of variegated abelia cultivars in the trade, and represents another great ornamental plant with origins here in North Carolina. 'Kaleidoscope', discovered at Panoramic Farm in Marshville, North Carolina, originated as a bud sport of Abelia ×grandiflora 'Little Richard'. Like 'Little Richard', 'Kaleidoscope' shows compact growth, semi-evergreen foliage, and a dynamic display of foliage color throughout the year. Foliage emerges with a bright yellow edge surrounding a green center, then transitions to a creamy yellow in summer. Fall foliage is an attractive combination of yellow, orange, and red. Petals in emerging flower buds show very light pink color, fading to white as the flower opens. We have had 'Kaleidoscope' on trial for one year at the JCRA. It has performed well, but we have noted that 'Kaleidoscope' produces a number of vigorous upright shoots that should be cut back to maintain the typical compact growth habit of the plant. Formation of vigorous shoots seems to be typical of many dwarf abelia cultivars that have arisen as bud sports, suggesting these cultivars may be chimeric for genes controlling growth rate. 'Kaleidoscope' has been patented (Plant Patent 16,988). Quite frankly, it pains me to write a "j" instead of an "i" in the generic name, for in my heart I know that Linneaus intended the use of "i." However, since he is no longer here to support my contention, we'll go with the "j." 'Silver Anniversary' was developed by plant breeder Peter Moore in England. It arose from a cross of the Asian species Buddleja crispa and B. loricata from South Africa. 'Silver Anniversary' currently resides in the Klein-Pringle White Garden at the JCRA. Bright silver leaves exhibited throughout the growing season are its major ornamental attribute. Inflorescences containing creamy white flowers are small and do not contribute significantly to the ornamental display. 'Silver Anniversary' demonstrates average vigor, growing about 4'-5' a year after heavy spring pruning. 'Silver Anniversary' produces no viable pollen, and to date appears to set no viable seed. Because of concerns regarding the invasive potential of Buddleja, this sterile cultivar should be a welcome alternative for landscapers and consumers. Plants with bright silver foliage provide so many opportunities for creative use in the landscape, and the number of woody shrubs with silver foliage is very limited. I vividly recall Edith Eddleman extolling the virtues of silver foliage to students in my perennials class some years ago, relating how silver foliage accentuates and brightens the color of neighboring plants. Weaving this great plant into your herbaceous and mixed border designs will brighten up your gardening life! A U.S. Plant Patent has been applied for. Both of these new redbud cultivars were developed by Paul Woody of Morganton, North Carolina. Recognizing the novel features of two plants among a large population of redbud seedlings derived from a local nursery, Paul named them 'Ace of Hearts' (right, left) and 'Little Woody' (right, right). Both cultivars demonstrate dwarf, compact growth habit, and would be excellent landscape candidates for those with smaller landscapes. Both plants have been patented ('Ace of Hearts' = U.S. Plant Patent 17,161 and 'Little Woody' = U.S. Plant Patent 15,854). Paul Fantz, Ph.D., Department of Horticultural Science at NC State University, prepared both patent applications on Paul Woody's behalf. Paul Fantz published a release description for both cultivars in the scientific journal HortScience, volume 409, pages 2209-2210. I first saw both of these cultivars some years ago as one-year-old grafted trees in the nursery of Harald and Alex Neubauer in Belvidere, Tennessee. Even in the nursery row, the distinct character of both of these cultivars was evident. 'Ace of Hearts' is named for the small, shiny, heart-shaped leaves that lack the reddish-purple pigmentation typically found on emerging foliage of redbud. The original tree (eight years old) formed a compact, multi-stemmed tree, about 13' tall and 16' wide, with a dense, broad, dome-shaped crown. The flowers are smaller than typical redbud, light violet, and very abundant. Because fruit are rarely produced, nuisance seedlings will not be found in the garden. 'Little Woody' is slightly more dwarf than 'Ace of Hearts', and differs primarily in leaf morphology and pigmentation. Leaves of 'Little Woody' are also small and heart shaped, but are a bit more ovate than 'Ace of Hearts', and also differ in being very rugose. Flowers are purple, small, and like 'Ace of Hearts', appear to be sterile, as few fruit are formed. Both cultivars are currently available in the commercial trade. Ahhh…the weather gods once again smiled upon the JC Raulston Arboretum for the 2007 Gala in the Garden. It was a beautiful day for 650 friends of the Arboretum to come out and support our annual fund-raising event. This year, a dotted theme was highlighted by the bright tablecloths in each auction tent and a beautiful JCRA ice sculpture donated by Ice Occasions. As the Southern String Band played, attendees strolled around to the various tents to bid on their favorite item. The Daffodil Yellow and the Purple Passion tents featured a variety of framed pictures, original artwork, gardening items, pottery, and sports memorabilia. The Sublimely Lime, Pink Posies, and Regal Purple tents showcased plants donated from nurseries all throughout North Carolina. At the end of the day, the auction raises over $28,000.00, all of which goes directly to outreach and programming at the Arboretum. The Gala was also a very special day for Denny Werner. He was appointed as the second recipient of the J. C. Raulston Distinguished Professor at NC State University. This award recognizes his outstanding job of leading the Arboretum forward with projects like developing the master plan, introductions of new plant materials – including his own new butterfly-bush and redbud introductions – and many more innovative ideas that continue to bring the Arboretum local and national attention. All in all, it was a wonderful day that will truly benefit the Arboretum in the year ahead. Jim and Kathy Deal, honorary co-chairs, of Pender Nursery, and Mark and Julie Fleming, event co-chairs, along with the Gala committee and many dedicated volunteers did a great job of making this Gala one of the most successful in the history of the event. And of course, the event would not even have been possible without the generosity of our sponsors and silent auction donors. To everyone who attended or contributed in anyway, a big thank you goes out to you! 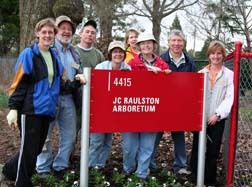 Gilmore Plant and Bulb Co.
Last September, the JC Raulston Arboretum was the lead garden on the Garden Conservancy Open Days Program in Raleigh. Open Days serves as the primary educational outreach for the Garden Conservancy and is a major component of their mission. The Raleigh Open Days ended up being one of the most successful in the country due in part to the hard work of our volunteers and members opening their gardens up to the public and working on the days of the event. Thank you everyone who had a hand in this great event and to Cyndy and Dave Allison, Sylvia Redwine, Mary and William Joslin, Carol and Lacy Reaves, and Tommy and Linda Bunn for showcasing their beautiful gardens. This year, we again have the distinction of being the lead garden on the tour that features a look into five private gardens in our area on September 22 and 23, 2007. The JCRA will receive a portion of the ticket sales as a donation from the event. Check out http://www.gardenconservancy.org/ for updates on the 2007 Open Days. The volunteer activity at the JCRA is nonstop these days. Spring and fall use to be our busiest times, however, volunteers did not miss a lick during the summer. The gardens look fabulous regardless of the season thanks to the volunteers, staff, and interns that work in concert caring for this very special place. The following two pages of photographs are just a sample of the tasks volunteers see to so we all can enjoy the JCRA. Come visit and see for yourself! The Poinsettia Open House has become a popular holiday event. It is a joint effort of the JCRA and John Dole's, Ph.D., floriculture research program. It takes over a dozen volunteers to move the poinsettias into the Ruby C. McSwain Education Center from the research greenhouses, set up, and then dismantle. 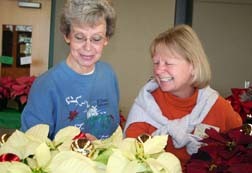 In the photograph below, Genelle Dail and Anita Kuehne admire their favorite poinsettias. The Gala in the Garden requires JCRA volunteers' efforts at every turn. Many of the volunteers' activities are behind the scene in planning and preparing for the big day. This starts early in the year with the mailing of the invitations. 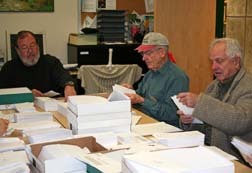 John Pelosi, Tom Bumgarner, and Claude Caldwell and several other volunteers devoted their time preparing the invitation mailing. The Winter Garden is getting very special care from a new gardening team led by Helen Yoest. The Raleigh Garden Club organized a team of over a dozen members that focus their efforts on maintaining the garden for your enjoyment. 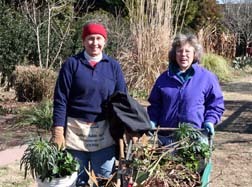 Alberta McKay and Diane Kuzdrall haul weeds and prunings to the compost. There are many gardens at the JCRA that need regular attention. Let us know if you have a group that would like the opportunity to be part of our team and take the responsibility to look after a garden at the JCRA. The roving gardening team took time out for a photograph during their morning's work, planting annuals at the JCRA pedestrian entrance. Included are Monika Coleman, John Pelosi, David White, Barbara Kennedy, Nancy Council, Annie Hibbs, Ralph Whisnant, and Barbara Blackwell. This team meets every Tuesday morning and just as their name indicates – they rove the garden doing whatever needs to be done. The team has also taken on the JCRA parking lot gardens so that visitors always get a good first impression. In addition, this group is the training ground for new weekday volunteers. Barbara Kennedy, the working leader, and the roving gardening members provide hands-on training for new volunteers. Thank you Barbara and team members for all that you do for the JCRA! Wayne Friedrich and David White, try out the new Visitor Center picnic table they just assembled. Thank you guys for your patience and tenacity in completing this task. A special thanks to Bobby Wilder, a long-time supporter and volunteer, for his generous donation of funds for the purchase of this picnic table. A troupe of volunteers spread out through the Arboretum taking a couple thousand cuttings in late spring. In this photograph, John Pelosi, Wayne Friedrich, and Mary Caldwell are sticking the cuttings in mist beds. A big thanks to all that helped. Over 60 volunteers and their guests enjoyed an open garden potluck hosted by the Werner family in June. 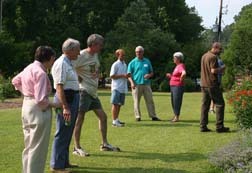 The below photograph shows the group admiring their fabulous perennial border. The outing celebrated the JCRA volunteers! Virg Birkin weeds the Connoisseur Plants in preparation for member pickup. Virg logged over 200 volunteer hours in 2006 and over 100 for 2007. Virg passed away in June 2007. We all miss seeing him each week and send special thoughts up as we follow his footsteps.